Introduction: A structure refers to a system of connected parts used to support forces (loads). A structure refers to a system of connected parts used to support forces (loads). Buildings, bridges and towers are examples for structures in civil engineering. In buildings, structure consists of walls floors, roofs and foundation. In bridges, the structure consists of deck, supporting systems and foundations. In towers the structure consists of vertical, horizontal and diagonal members along with foundation. A structure can be broadly classified as (i) sub structure and (ii) super structure. The portion of building below ground level is known as sub-structure and portion above the ground is called as super structure. Foundation is sub structure and plinth, walls, columns, floor slabs with or without beams, stairs, roof slabs with or without beams etc are super structure. Many naturally occurring substances, such as clay, sand, wood, rocks natural fibers are used to construct buildings. Apart from this many manmade products are in use for building construction. Bricks, tiles, cement concrete, concrete blocks, plastic, steel & glass etc are manmade building materials. Cement concrete is a composites building material made from combination of aggregates (coarse and fine) and a binder such as cement. The most common form of concrete consists of mineral aggregate (gravel & sand), Portland cement and water. After mixing, the cement hydrates and eventually hardens into a stone like material. Recently a large number of additives known as concrete additives are also added to enhance the quality of concrete. Plasticizers, super plasticizers, accelerators, retarders, pazolonic materials, air entertaining agents, fibers, polymers and silica furies are the additives used in concrete. Hardened concrete has high compressive strength and low tensile strength. Concrete is generally strengthened using steel bars or rods known as rebars in tension zone. Such elements are 'reinforced concrete' concrete can be moulded to any complex shape using suitable form work and it has high durability, better appearance, fire resistance and economical. For a strong, ductile and durable construction the reinforcement shall have high strength, high tensile strain and good bond to concrete and thermal compatibility. Building components like slab walls, beams, columns foundation & frames are constructed with reinforced concrete. Reinforced concreted can be in-situ concreted or precast concrete. 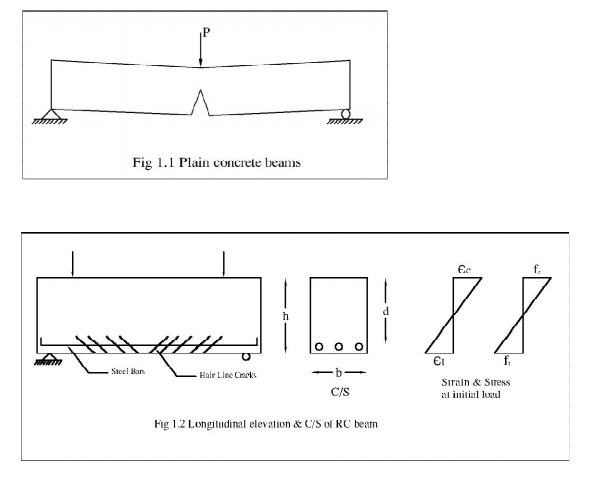 For understanding behavior of reinforced concrete, we shall consider a plain concrete beam subjected to external load as shown in Fig. 1.1. Tensile strength of concrete is approximately one-tenth of its compressive strength. Hence use of plain concrete as a structural material is limited to situations where significant tensile stresses and strains do not develop as in solid or hollow concrete blocks , pedestal and in mass concrete dams. The steel bars are used in tension zone of the element to resist tension as shown in Fig 1.2 The tension caused by bending moment is chiefly resisted by the steel reinforcements, while concrete resist the compression. Such joint action is possible if relative slip between concrete and steel is prevented. This phenomena is called 'bond'. This can be achieved by using deformed bass which has high bond strength at the steel-concrete interface. Rebars imparts 'ductility' to the structural element, i.e RC elements has large deflection before it fails due to yielding of steel, thus it gives ample warning before its collapse.